The DC Rotary Cutters additional blades allow for perforating and scoring. Cutter only comes with a cutting blade. 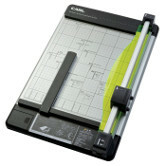 This three in one trimmer can cut up to 3 sheets of copy paper also cuts card stock, black core mat board, thin foam board, and plastic sheets. Adjustable magnetic paper stop helps hold paper in proper position, great for repetitive cuts. Calibrated deck features 1" square grid from top to bottom and side to side. Base is calibrated in 1/8" and centimeter scales on top, bottom, and left-hand side. Built in storage area for spare cutting blades and mat. Alignment marks for 8.5" x 11" (letter), 4" x 6", 5" x 7", and 8" x 10" (photo) make easy work of trimming precise dimensions. Cut copy paper, card stock, black core artist matboard, thin foam board, and plastic sheets. 3 convenient sizes available 12", 15", and 18".